Nothing can be more difficult to negotiate than a breakup. Whether ending a business or personal relationship, the entire situation is fraught with emotions like anger, hurt and anxiety. A breakup is a hunt that takes you down an uncertain trail but by applying the same tactics you use when hunting success, you can hit your target. Even this unpleasant hunt can end with a trophy when you are able to get away from emotional judgment and focus clearly on desired outcomes. I was helping a friend recently end a partnership with her long-time business partner. The first proposal arrived and it was a low-ball offer. She was furious and insulted; the steam was practically coming out of her ears. After she vented and her vision cleared, I was able to ask if she was ready to focus on her desired outcomes. The first thing we did together was pull out a clean pad of paper and write down clearly in big bold print her targets on terms of her ideal final deal. Next, we went through all of the leverage points and how to use them to make sure both parties can live with the resolution, creating a win-win so the partnership could end amicably. These tactics worked and I am excited to tell you they are now finalizing documents on an acceptable deal in less than two weeks. 1) By removing emotion from the equation, we were able to rise above the fray and keep her head clear so her target was now visible and focused. 2) We figured out how to achieve her desired outcome while still considering the other party’s point of view. 3) We created a non-binding counter offer that was clear and focused, while still addressing the concerns of both parties. I want YOU to be the one controlling the hunt and hitting the bull’s eye of the targets you are after. So keep your cool, stay focused and control the situation. 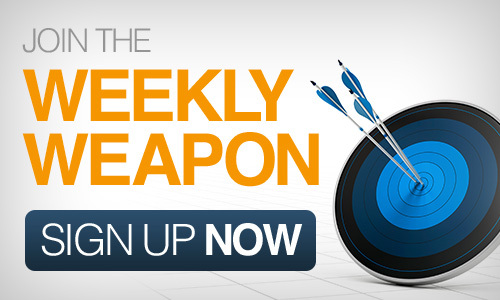 This entry was posted in Your Weekly Weapon With David Farbman on March 21, 2014 by David.